Tuesday, August 2 at Chinatown Soup, 16 Orchard Street, Chinatown. Opening reception 6-9pm, show on view through August 9. More info here. Gallery and art space Chinatown Soup will host this event that’s part art show, part pop-up shop showcasing the work of 10 local companies who make pins and patches. Don’t expect vintage band logos or anything of that sort, as this is a show of new, original work by artists. 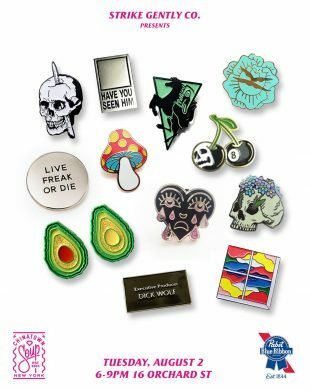 The first 50 who come to the opening will receive a free pin or patch from Strike Gently Co., and free PBR will be a-flowing. Get there feeling eager, and leave full of beer with a slew of cool new accessories for your denim vest, tote bag, or whatever you’d like.